Dr Oz and Rachael Ray were hosting a broccoli rabe cook-off that had Robin, Roberta, and Rob showing off their best recipes that uses the delicious star ingredient: broccoli rabe. Robin already shared her recipe for broccoli rabe with chicken and apricots, and Roberta was up next. 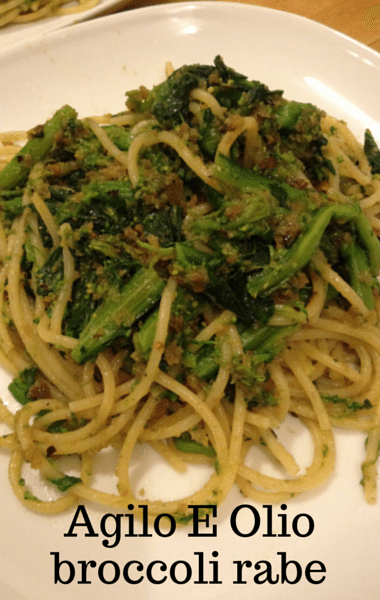 Rachael recognized it right away, but Roberta explained to everyone else that she made Agilo e Olio with Broccoli Rabe. Agilo e olio is just garlic and oil and the good news is that it heats up well for a delicious dish the next day! Have you made this recipe or one like it? What would you change or add to make it your own? Do you have any tricks for cooking with broccoli rabe?